This photo was taken several months ago in Del Mar, California. There had been a rain storm earlier that day. 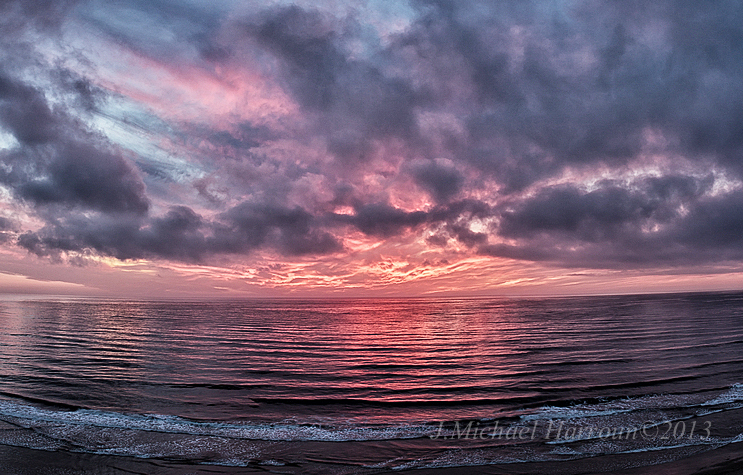 I expected that residual cloud cover would obscure the sunset. However, because some of the most dramatic sunsets occur when the weather is changing, I drove 15 miles from my home to this beach. I usually do this only when my energy and mood will allow me to enjoy walking on the beach and absorbing the feelings from the ocean, even if no sunset is visible. That way, regardless of whether the sunset is visible, I do not feel that my time has been wasted. Technique: I set up, as is my usual technique, with tripod and shutter release cable, preparing for shooting a panorama if I was presented with a sunset involving a large area of sky . I was rewarded with just such an opportunity. This photo was taken about 20 minutes after the actual setting of the sun, when the cloud formations will often change quickly, and when pink color often developes. This is a three frame panorama with the camera in a vertical position. Processing: Although I had exposed correctly using the histogram, the original images were flat and dull, showing very little contrast (as is common with unprocessed digital images). To remedy this, Adobe Camera Raw was used to increase brightness, contrast and (slightly) sharpness; and to decrease noise. Still the image looked lackluster. So Nik Color Efx Pro 4 (I strongly recommend this program to bring life and depth to images) was used for tonal contrast adjustment, which created the depth and drama that I had remembered. I did not just color or saturation. Photoshop Elements clone tool was used to ease the abrupt transitions of the waves from frame to frame. (These artifacts are inevitable when wave movement is present, as the waves change position sightly while the tripod head is being rotated in preparation for the next frame of the panorama.) Then sharpening for display was done with Nik Sharpener Pro (another program that I strongly recommend). The final image accurately reflects what I was seeing and feeling at the time of the actual sunset. I welcome comments and, even better, criticisms (as they will improve my skills). J. Michael Harroun©2013 All rights reserved. This entry was posted in Digital imaging, Digital Photography, Nature, Nature Photography, Photographic technique and tagged digital imaging, digital photography, nature, nature photography, photo processing. What a great shot. Makes me miss California! Yes, California has a great deal of beauty. Thank you for your compliment and for taking the time to comment. Another beauty! So glad to live a sunset vicariously, since we have so few colorful ones in the winter. It has an interesting curvature of the tide and skyline. Beautiful, soft colors. Thank you. The curvatures are the result of the panorama processing. Other appearances were available to me, but this seemed to help the perception of depth the most. Beauty, calm, serenity! Fantastic photography & editing! I’m glad this image created these feelings in you. I agree. I’m glad to hear that it generated that response in you.